Welcome to the 2013 April A to Z Blogging Challenge! 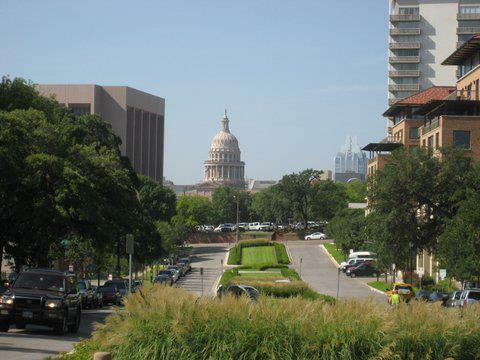 Today marks the first day of the challenge, and my “A” pick is the beautiful, friendly capital city of Austin, Texas. I traveled to Austin for the first time right after Christmas in 2008. At the time, I was one of six candidates for two open positions on the Association of Certified Fraud Examiners’ Board of Regents. The results of the election wouldn’t be known until after January 1, 2009, and I had no idea I’d be elected. So, my husband and I had a vacation in the “Live Music Capital of the World.” (I would fly back to Austin in February of 2009, and the subsequent year, too, as a Regent for the ACFE). 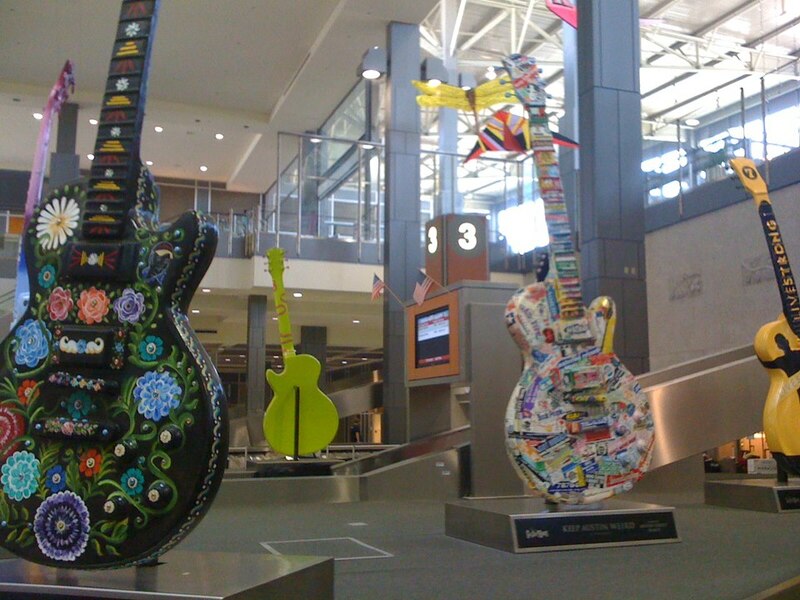 There are guitars in the airport! How great is that? And in late December, we were treated to mild weather (enough to swim in the Hilton’s rooftop pool, although our friends thought we were crazy – hey, 60 degrees in December is pretty good for us New Englanders). We had our first (and quite possibly only) chicken-fried steak at the Gristmill out in Gruene (“hand breaded and deep-fried, topped with cream gravy!”). Lone Star beer at Chuy’s. Fish tacos and Shiner Bock at the Hula Hut, and again at Iron Cactus. I’ve yet to find fish tacos as good as those in Texas, and I live in the Ocean State! Talk about Texas pride. Oh, if only we Rhode Islanders felt this way about our little state (but sadly, we don’t). I took a walk around my friend’s neighborhood one afternoon and every house proudly displayed something about Texas: the state flag, the lone star (on a mailbox, flagstone, side of the house), the Texas Longhorns. The University of Texas football stadium holds 100,119 fans (the entire cities of Warwick and Newport combined). You want to support the Longhorns? Wear burnt orange. Who knew? I arrived in Austin wearing that color, purely by accident, and was welcomed as a native daughter. Austin is unique. Growing. Different. If you think Texas is all about guns and cattle and Dallas, think again. “Keep Austin Weird” isn’t just a slogan, it’s a way of life for some Austinites. I’ve been there four times, and would return in an instant. Because I still haven’t been to Franklin BBQ, Stubb’s, or Lambert’s. What a great topic idea. My daughter did a project on Texas and then wanted to go there. But we are from CT and haven’t quite made our way there yet! I’m in RI, Cindy! Thanks for visiting, neighbor! I’ve never been to Austin, but I hear from lots of people about what a wonderful place it is. Visiting from AtoZ. M, Nice start to the challenge! Good Luck. I just got back from Dallas….not really feeling the love……but I know Austin has ALOT of music! I hope to get there someday. Thanks, Dennis. Try Austin next time – I think you’ll see a real difference. Austin is such a great city and Chuy’s is one of my favorites. I’ve been many, many times. I love Austin! I can’t wait to see the panoply of places you are posting! 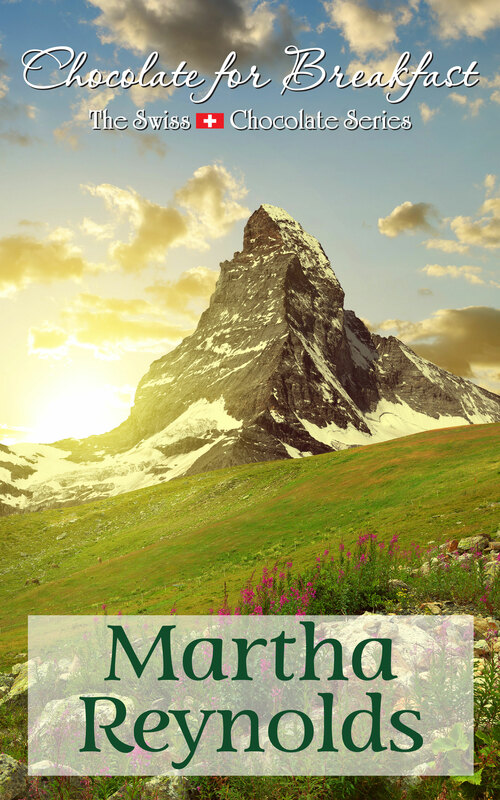 Nice entry, Martha. I’ll be back. Thanks. I like this theme and had a lot of fun with it! Austin is on my list for sure! Speaking of lists, I can’t wait to see the other 25 Alphabet Places. What a great challenge–good luck! Thanks, Francine! This is a good theme, I think. Although I’m not much of a world traveler these days, I’ve got a nice mix of places. Martha, I love Austin too! My brother Kevin has lived there for 31 years…just passing through and never left! He was their favorite morning DJ for 25 years and former City of Austin Commissioner of Music! He now works developing the SXSW Music Conference and has a Saturday Texas music show on their PBS affiliate KUT. I am a proud sister! And there is some good eating there too! But stay away from that “cream sauce”!! They scoop the grease off the grille into jars and them mix it with flour!! When we saw that chicken-fried steak, I almost borrowed Lipitor from Jim! But Austin is really healthy – Whole Foods, walking and running trails – and a young, fit population! Thanks, Eileen. Outside of Austin, I’ve only been to Dallas, Paula, and it was years ago. If you go to Texas, I’d recommend Austin and San Antonio. I’m glad you’re participating in this challenge, too! Austin is on my list of places to visit when I eventually make it to the states, the first time I heard about it was watching the wrestling and now like many Brits am fascinated to find out if its true that everything is bigger in Texas!!!!!!!! !